Legend is one of the films from Tom Cruise's early years, released right before Top Gun, and it is as the name says, legendary. I'd even say that this is his best film. Well, I don't know that it's best in terms of quality of acting, depth of plot, etc., but it is my favorite and it is hands down the best in terms of achieving awesomeness and terribleness in the same fell swoop. Should also mention that this is directed by Ridley Scott, and Alien and Blade Runner are higher-ranked in my list of favorites as far as his flicks go. 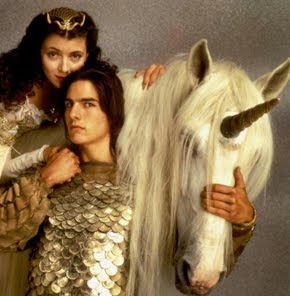 In any case, the plot is as follows: Tom Cruise is Jack, a forest dweller who frolics in the woods with unicorns who are the bearers of peace and light and happiness to said woods. His time frolicking is also shared with special lady friend Lili (Mia Sara). But the plot must develop, so the frolicking goes on hold when the Prince of Darkness (Tim Curry) implements his plan to kill the unicorns to get rid of the day and turn light into darkness. Lili gets kidnapped in the process, so Jack embarks on the adventure of a lifetime to rescue Lili and the unicorn and save the day, with the help of the rest of the forest folk, of course. Spoiler: there is of course a happy ending, but have you ever seen a unicorn movie that doesn't end well? The brilliant casting and incredible plot should be enough to convince you that you absolutely need to see this, but as always, don't take my word for it, please see it yourself. It is epic. And oh-so-worth-it.